Nov 1, 2018 10:55:21 AM / by Alex A. Goldberg, Ph.D.
Polymerase chain reaction (PCR) is one of the most commonly performed laboratory procedures. This technique, used to amplify DNA or RNA sequences, is integral to a host of industries and environments, including healthcare, research, forensics, and agriculture. This powerful technique can be used to measure levels of gene activation, discover mutations in samples from patients with cancer, and identify sources of bacterial infection. However, despite recent advances in PCR technology, labeling PCR tubes remains problematic. Labeling PCR tubes is a difficult task. For basic PCR protocols that use 0.2 ml tubes, there is limited room on which to handwrite legibly, either on the top or side of the tube. Tube strips further limit the writable area, with each tube connected to the next one in the strip. Even with small fine-tip markers, writing becomes illegible and smudges easily, a problem further aggravated during each PCR cycle, which generates temperatures as high as 95°C (203°F). Labeling PCR plates can also be a nightmare. Plastic covers used for these plates afford little room for labeling and must be removed if a sample is needed to verify the identity of the fragments generated. These covers are also not tailored for labeling purposes, as the surface is bumpy once it is affixed to the top of the plate. Altogether, this makes labeling PCR reaction tubes inefficient and time-consuming. The new patent pending PCR-TagTrax™ lets you label PCR tubes with more information than either handwriting or label dots can provide. Its flexible design allows you to tag individual PCR tubes or strips containing up to 8 tubes at a time. You can also use several tags folded into a stacked booklet or in a fanfold configuration to store even more information. Adhesive-free and glove-friendly make the tags easy to use. 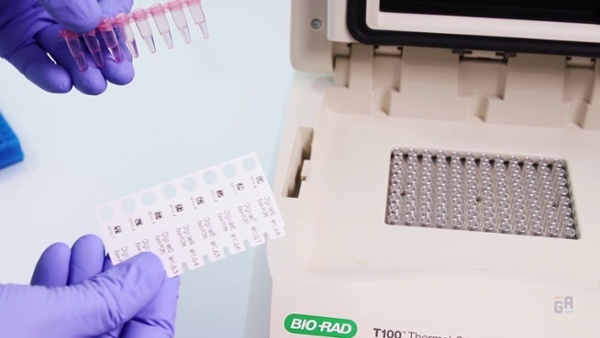 The flag design of this PCR Sidekick provides a bird’s eye view of your labels that can be seen immediately upon opening the thermocycler, without the need to pull out and read each tube or plate. You can label your samples immediately after you’ve finished preparing the plate, as the PCR-TagTrax–tagged samples can be amplified without losing label integrity or legibility, or interfering with the thermocycler. With a perforation line down the middle, PCR-TagTrax can be used as a stand for your labels, making it easy to label your samples, run them, then store them in the refrigerator or freezer. The tear away flap can also be used to keep a record of your plates and samples, making them easier to organize for storage. Printable with all common thermal-transfer barcode printers, the label can be marked with alphanumeric text, serialized numbering, as well as 1D and 2D barcodes.